It was August of 1962, summer time in Liverpool, England. It was a lovely day, the men went to work as usual, however during their lunch breaks the majority of the workers decided to eat outside. The women with children took the advantage of taking their children out to play for hours, talking to other mothers and anyone who passed by and happened to be available for a chat. Students used their study breaks outside, under trees, sitting in groups on park benches and the elderly, acting as though they were teenagers, shopped on the streets, more cheerful than usual. A lovely day indeed. Not too far from Penny Lane, on the street of Garmoyle Road, in a Victorian house used as flats for young and old spinsters, in one of the rooms, lay Cynthia Powell, moaning and groaning. She wasn't feeling so well and it was unusual for her to be down during the afternoon. She was forced to miss class this morning and, a few times, drag her feet and self to the bathroom. She was scheduled to go to work early this evening at Woolworth's and didn't want to miss her shift, she really needed the money to pay for her electricity bill and some groceries. 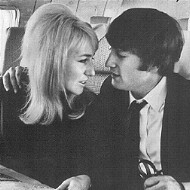 Her boyfriend, John Lennon, had visited her the night before, leaving early so that he could catch a ride with a few friends to drop him off at his home over at Menlove Avenue. That night, she was healthy, and now, all of the sudden, she was sick. She didn't know why, but she came down with a couple of questions, Do I have the flu? Did I catch a cold from one of the co-workers or fellow students? Or maybe I was working to hard, hard enough for my body to say, "take it easy". She did not know. About fifteen minutes before ten, where Cynthia was to allow to end her shift, John came by to walk her back home. John was sweating after playing with the Beatles at the Cavern Club in Matthews Street. "Hello luv, how's the day for you been?" he asked her after kissing her on the cheek over the counter. "A bit horrible in the beginning," she responded, "I felt to ill to get up earlier and missed my class." "Oh dear, well I hope you got something for your ill," he said. "Yes, I just got myself some medicine to help me get through this rough patch," she informed him. A customer came by and asked her for help. John went off to check out the latest music magazines and waited for Cynthia to get off her shift. Cynthia helped with the customer and wrapped up her shift. She went in the back room, unlock her locker, took off and hung up her smock, retrieve her purse, made sure that she has the medicine with her and then locked her locker. She went and found John and waved goodbye. One of the store clerks quickly reminded her that she has another shift in the morning and to be here by nine. Cynthia nodded and went out the door. During the walk to Cynthia's flat, John told her about the gig he just played with the Beatles at the Cavern. He told her that Paul McCartney was a bit depressed since breaking up with Dot Rhone, a friend of Cynthia's and former neighbor who just moved out about a week ago. Cynthia's heart went out to Dot, she wasn't really mad at Paul for breaking Dot's heart, but thought that he could've done it better. But both Paul and Dot were young and a bit immature for a relationship. John and Cynthia arrived at her flat and Cynthia asked him if he was spending the night with her. He told her that he was. They started to kiss, but John broke away, saying that he better take a shower, he stinks with sweat, sweat and more sweat. Cynthia nodded and John went to her bathroom to take a quick shower. While he was in there, Cynthia went to the kitchen with her medicine and got a spoon, according to the directions, it was time to take another swig. By the time John got out of the shower, Cynthia was already in her nightclothes and asleep. John, just wearing a towel, was a bit disappointed that she was asleep but remembered that she had informed him that she wasn't feeling to well. She better get some rest! John took off his towel and crept to bed and lay next to her, taking her into his arms and falling asleep himself.